A new documentary, "RBG," focuses on the Supreme Court associate justice. Ruth Bader Ginsburg is best known for becoming the second woman ever to serve on the United States Supreme Court, but more recently, her reputation has taken on a life of its own. Over the past few years, Ginsburg earned a rap-inspired nickname ("The Notorious R.B.G.," of course), appeared on T-shirts and tote bags, and has been lovingly impersonated on "Saturday Night Live." The feminist trailblazer has, in many respects, made law a little cooler -- and now there's a new documentary celebrating her life. Directors Betsy West and Julie Cohen told ABC News that they wanted to make sure audiences saw Ginsburg for who she is: a lawmaker who has tirelessly brought truth to power over her decades-long career, but also, a wife, mother and grandmother with a remarkable personal life, too. "People have a certain image of Justice Ginsburg, not completely unmerited, as a soft-spoken, very serious, sober, as she would say, judge," Cohen said. "But what surprised us was really all of the human moments that we were able to witness and bring out in our film: the joy on her face when she's talking about her late husband Marty, the zingers that she kind of tosses off when she's doing a public speaking engagement, and maybe most of all, the exuberance and thrill she seemed to get watching Kate McKinnon's impersonation of her on 'Saturday Night Live.'" 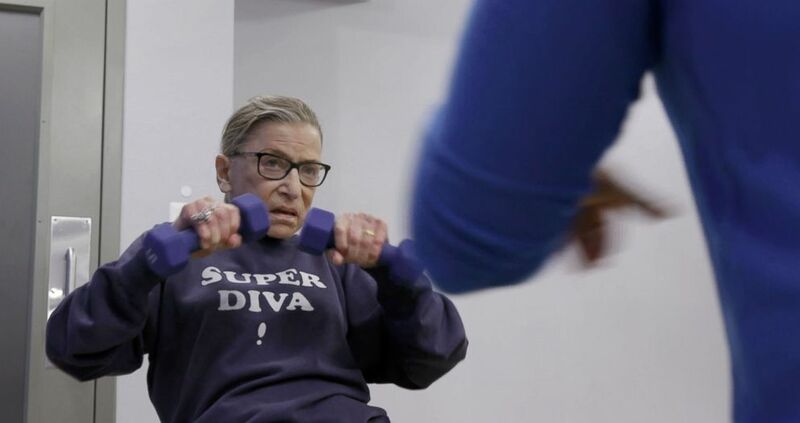 (Magnolia Pictures) Associate Supreme Court Justice Ruth Bader Ginsburg does her workout routine in scene from the movie, "RBG." Ginbsurg's love story with her husband, Martin Ginsburg, is featured heavily in the film, particularly because of the support he gave to her. Though they were both Harvard-educated attorneys, Martin Ginsburg recognized that the work his wife was doing to assure equality for women was important, and made sure that when a position opened on the Supreme Court in the early 1990s, she was considered. "Ruth and Marty Ginsburg's marriage would be unusual by even today's standards, but in the 1950s when they first met and married, the thought of a husband, brilliant in his own right, was willing to take a backseat at many periods in his life for his wife's career and really pushing her forward is a really beautiful story to watch," Cohen said. "It also kind of combines with her sense of humor too that they used to joke about this," added West. "Marty Ginsburg was not threatened by his brilliant wife, and he would make jokes about the fact that he did the cooking or he had to drag her home at night when she was working late. He reveled in it." 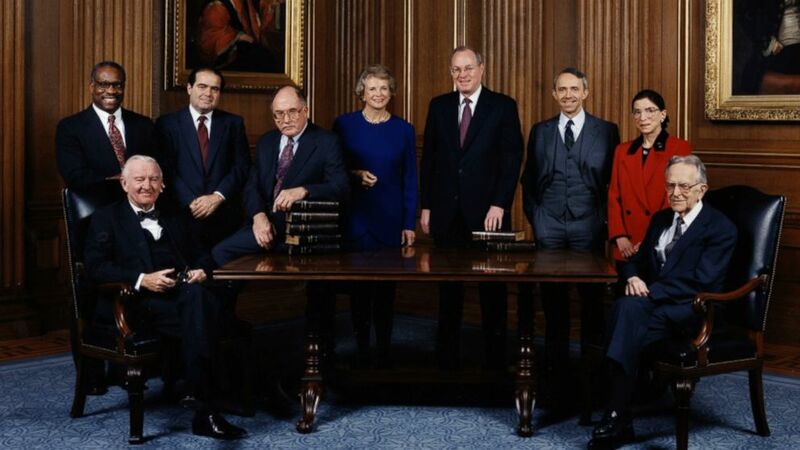 (Magnolia Pictures) The Supreme Court Justices circa, including Ruth Bader Ginsburg circa 1993 in a scene from the movie, "RBG." Her sense of humor is another major topic in the film. At one point, audiences see her sparring with her friend, late Supreme Court Associate Justice Antonin Scalia, ("She's the one that gets the last laugh!" Cohen said) and reacting to McKinnon's impression of her ("She said she wishes she could tell colleagues that they've been 'Ginsburged,'" West added). And because the famous judge doesn't necessarily laugh easily, it provides for a real sense of accomplishment when she does. "Justice Ginsburg's daughter says in the film that when she was a kid, [she and her brother] kept a book called 'Mommy Laughed,' where they would make a notation of every time they were able to make their mom laugh because it was very rare!" Cohen said. Now, West and Cohen are seeing girls attending screenings of the film dressed as Ginsburg, and reading tales of how her story has inspired others. Cohen expects the number of law school applications by women jump in the next 15 years. 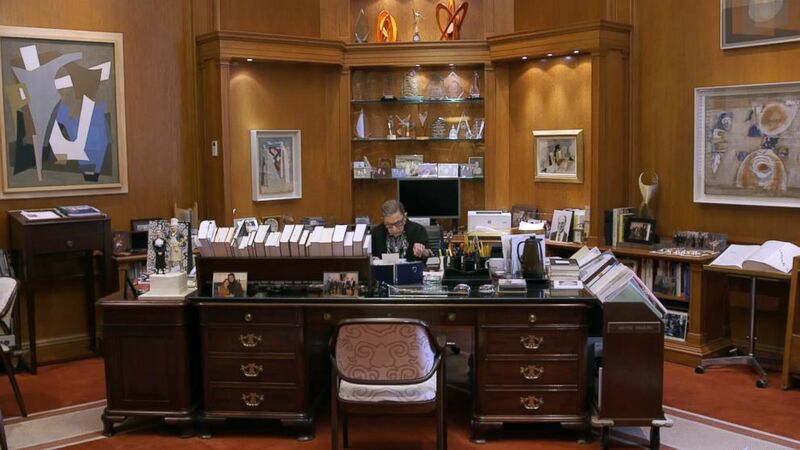 (Magnolia Pictures) Associate Justice of the Supreme Court Ruth Bader Ginsburg works in an office in a scene from the movie, "RBG." "The idea that you have a very accomplished 85-year-old woman being celebrated for her intellect and forcefully standing up for what she believes in -- that seems like that's pretty unprecedented," Cohen observed. "It's amazing." "RBG" opens in select theaters today.